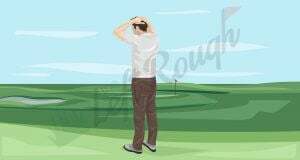 One of the things I’ve noticed about amateur golfers is that a lot of them struggle to gain distance. Many people also try to use their arms to generate club head speed and distance. The assumption is that distance comes from swinging the arms harder and faster. The arms tend to be the dominant body part that creates power in other sports, so why wouldn’t that be any different in golf? Unfortunately, or maybe fortunately, golf is very different than other sports. Even a baseball swing, which appears very similar is a very different move than the golf swing. While it is partially true that the swinging of the arms create club head speed, which result in distance, how it’s accomplished is misunderstood. A large part of this comes down to the rotation of the body and the shoulders are an indicator of good rotation. Not only that, but shoulder rotation can help keep a club on plane as well. What is Shoulder Turn in the Golf Swing? Both are important parts of the shoulder movement in the golf swing. The rotation of the shoulders, or shoulder turn, is the movement of the shoulders and upper body throughout the entire golf swing sequence. 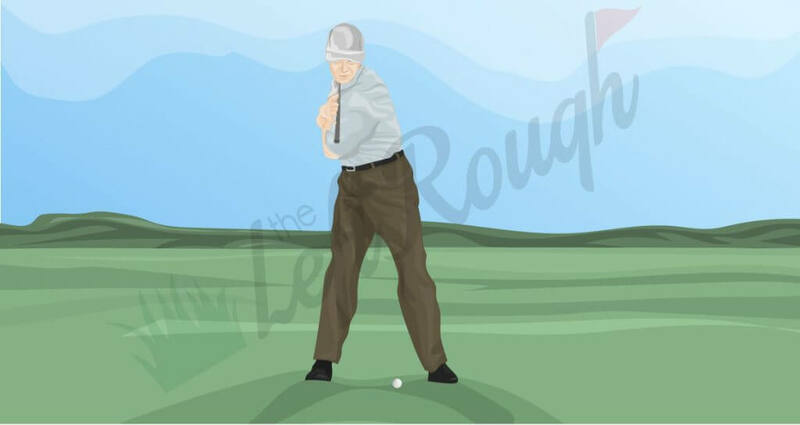 There are three parts to the shoulder turn in a good golf swing. In the backswing, your shoulders ought to turn 90 degrees away from the ball and away from the target. So, your chest will, pretty much be facing directly away from your target. If you were to draw a line across your shoulders, that line would be perpendicular to your target line. In the backswing, the shoulder tilt ought to be noticeable. We could get in to exact numbers, but that doesn’t help much to tell you that the average pro golfer has a shoulder tilt of about 35 degrees. What you need to know as a player in the backswing is that the front shoulder ought to be lower than the back shoulder. 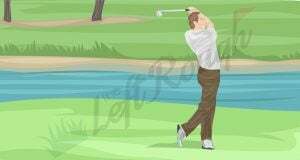 This gives you an angle pointing downwards towards the ball. It allows you to approach the shot from a steeper angle and get the ball in the air. The next part of the shoulder turn is in the downswing. In the down swing, the shoulders return to the address position. This means that the shoulder line is, once again, parallel to the target line and the chest is facing directly at the ball. This will allow you to square up the face and hit a relatively straight golf shot. 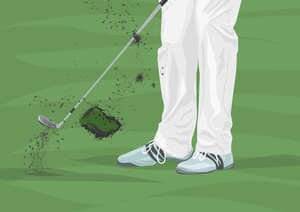 If you return to this position too early, you can leave the club face open too much. On the other hand, if you do it too late it can close down the face at impact. The tilt of your swing in the downswing, and more specifically at impact, is moving towards level. Ideally, at impact, you want both of your shoulders to be on the same plane. This means that through the downswing, the back shoulder has to drop back down to get even with the front shoulder. The final part of the shoulder turn is the follow-through. In the follow-through, or finish, the shoulder turn continues on, so that the chest faces the target and the shoulder line is, again, perpendicular to the target line. This will get you in to a position where you are facing the target and can watch the shot fly towards your intended target. Doing this too quickly often results in a pull and doing it too late can result in a pushed shot. Finally, the tilt of the shoulders after impact, in the follow-through, should be the opposite of the backswing. This means that the back shoulder is now the lower shoulder. This allows the shoulders to turn through properly. The finish position is where the shoulders will fully return to a level position, where they are both on the same plane. Why Shoulder Turn is necessary in Golf? There are a couple big reasons why a shoulder turn is necessary in the golf swing. Like I mentioned earlier, it helps golfers gain distance. The reason distance is a result of a good shoulder turn is because it’s maximizing the amount of torque you create. Torque results in speed and translates to distance, and we all want more distance. 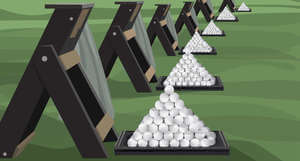 Not only does it help with distance, it also always a player to hit the ball with the proper angle of approach and path. Our bodies are made to move in a very specific way. If we don’t allow the body to rotate the shoulders, we’re basically fighting against our own body and how it wants to move. That results in incorrect angle of approach, the club face’s movement into the ball, and path, the direction the club swings. Allowing both of those to naturally swing together will result in a better, straighter, longer shot. Finally, shoulder turn is extremely important for accuracy. In my opinion, the direction of a shot is significantly more important than its distance. It really doesn’t matter if a shot travels 350 yards, if it’s also 100 yards off-line, you’ll struggle. If you hit a shot only 100 yards, but it stays in the middle of the fairway though, you’ll have a second shot that is much easier and can score. So, how is the proper turn executed? The easiest way to make the proper shoulder turn is to simply focus on your back shoulder (right shoulder for a right-handed player) and move it towards your back; dropping it straight back behind your head. This will force your front shoulder to turn with it, so that they have moved 90 degrees together in the correct direction. In this position, your sternum will face backwards, away from the target. Making sure the tilt is correct in the backswing is fairly simple. Focus on pointing your front shoulder directly at the ball by the time you get to the top of the backswing. 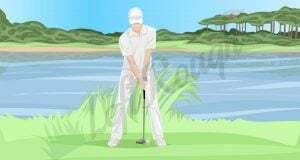 If you can do that, since the ball is low on the ground, your back shoulder will naturally rise in the air a bit. Next, let’s talk about the downswing. In the downswing, the exact opposite happens, you want that same back shoulder to move forward, towards the ball again. This turn will look exactly like the address position, so it’s easy to check that. It’s tricky when doing a full swing though, because you don’t want to start the follow-through turn until after impact. Your shoulders should be parallel to your target line at impact, no earlier or later. You want to begin the process of pointing your back shoulder directly at the ball on the ground. You won’t fully get there before impact, but it’s the idea that counts in this situation. As long as your back shoulder is moving towards the ball, you should have the proper shoulder tilt in place. Finally, here’s how you make sure the follow-through turn is correct. 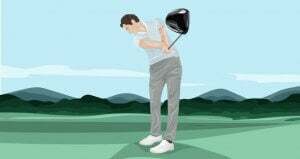 Once impact has occurred, you can focus on your back shoulder, again, following the ball towards the target. 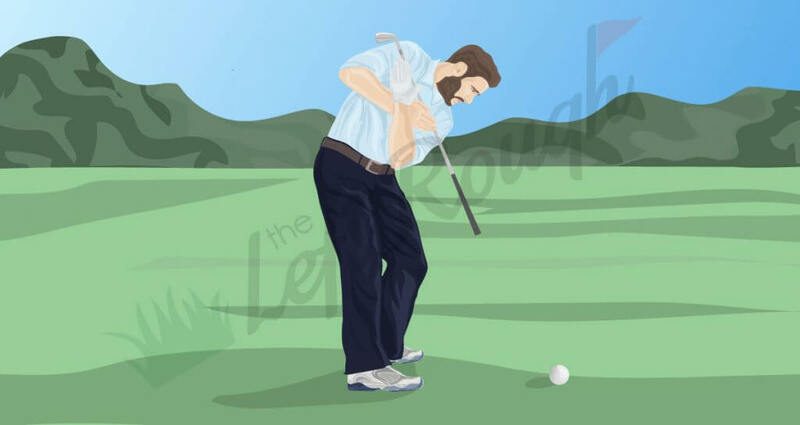 Once the ball leaves its resting position, the ball pulls your back shoulder forward towards the target. This will force your other shoulder and chest to turn the correct way. Making sure that shoulder continues down and through the impact zone will be crucial. This is sort of a continuation of the downswing tilt. After impact, your back shoulder will eventually point towards the location the ball used to be in and continue on towards the target. The important thing here is keeping the back shoulder lower to the ground than the front until the shot is fully complete and you are in your balanced finish position. The shoulder rotation and tilt are both things that are difficult to measure. Like I said above, we could give you all sorts of numbers and statistics one the perfect angle that is needed, but unless you’re actually putting yourself on video, measuring it every shot, and have unlimited free time to practice, it’s probably not going to help. Instead, getting the main concepts and position through drills will be more helpful. Here are a couple great drills to help you get the best shoulder rotation and tilt. 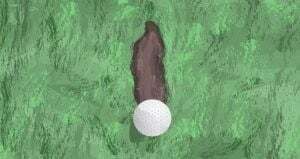 For this first drill, all you need is a golf club. You can even practice this one indoors if needed. Lay the club across your chest and fold your arms to make sure it stays in place. The golf club shaft ought to draw a line between your shoulders. 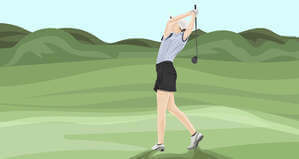 Then, take some practice swings without your arms, just with the body rotation. Focus on pointing the end of the club closest to your front shoulder down towards the ball in the backswing. 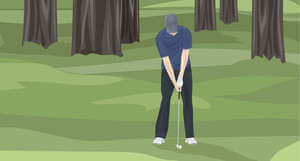 Then, the opposite for the downswing and follow-through; point the other end of the club towards the ball. This helps to magnify your shoulder line and which shoulder is lower at different points in your golf swing. This next drill is both a drill and a stretch. In the game of golf, flexibility is just about as important, if not more, than strength. Shoulder rotation and tilt is made much easier by flexibility in those areas of the body. Stand next to a wall, with the outside of one foot rested right up against the wall. Then, turn towards the wall with your arms folded across your chest. Flip and do this with your other foot and shoulder. What you’re doing here is simulating the feeling of turning your shoulders 90 degrees in both directions. It makes it easier to notice if you’re getting all the way to the right position or not. If you aren’t able to get turned the whole way, simply reach out your arms and leverage the wall to turn your body and feel a stretch in your upper body muscles. For this drill, all you need is someone to video your golf swing from a down-the-line perspective. Have them stand behind you and hit a few full golf shots on the driving range. Then, look at the video and draw a line down your shoulders at the top of your backswing and another line at the mirror image location in the follow-through. Both should have one shoulder lower than the other. Take a look at impact as well. From that angle of video, one shoulder should cover the other up, but you should be able to notice if they are level or not. The shoulder rotation and tilt in the golf swing is an often-ignored part of the swing. The important thing to remember is that both sides of the golf swing are basically mirror-images, with one shoulder lower than the other. They are also turned 90 degrees away from the original starting position of the ball. If you can do those things in your golf swing, you’ll be in good shape to hit longer and straighter shots in no time at all.